Imagine if you could remove carbohydrates from your diet, whilst still getting to eat them? The ultimate "have your cake and eat it" supplement is here! 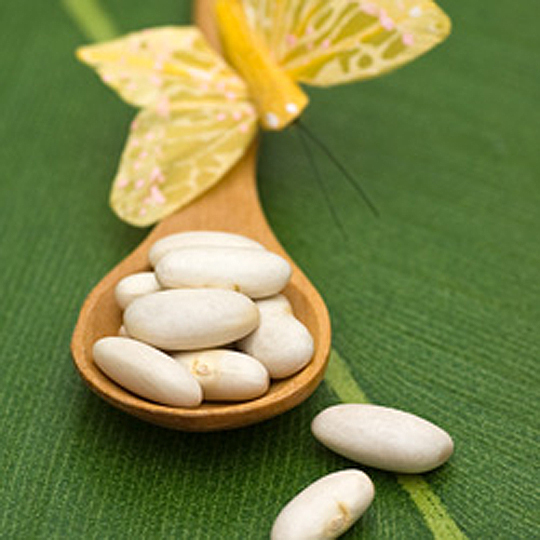 The extracted active ingredient from White Kidney Beans is known as Phaseolamin. This compound has a special ability to stop starchy carbohydrates in food being absorbed in to the body and converted in to calories. So, for example, if you eat carbohydrate rich pasta, the calories in the pasta made from carbohydrate will simply sail through your system; it's like the Adkins diet - but you actually get to eat those killer carbs! Starch and carbohydrate blockers like Phaseolamin have been around since the 70's, but with today's high strength standardised extracts, the strength and consistency of results is now far better than similar products from years ago. A double-blind, placebo-controlled study of 60 human subjects showed that those who took Phaseolamin lost an average of 6.45 lb (2.93 kg) in 30 days, compared to those on placebo, who lost less than 1 lb (0.45 kg), on average. Those participants on Phaseolamin also lost, on average, over 10% of body fat mass, and more than 3% in waist circumference. Whereas a sensible diet and exercise is always preferred to a carbohydrate blocker, our Active Health: White Kidney Bean Extract may help you get a weight control programme under way, successfully.